After serving his country in the US Navy during World War II our founder, Edward B. O’Reilly, earned a degree in Economics from Pennsylvania Military College (now Widener University). Upon graduation, he started his career in the heating, ventilating and air conditioning industry. 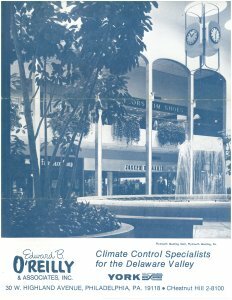 In 1954, with only $50 in the bank, Ed started Edward B. O’Reilly & Associates with partners Robert Fowler and William Henry. In 1961, to better serve the needs of his customers, he formed E.B. 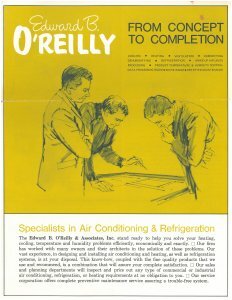 O’Reilly Servicing Corporation. From the beginning, Ed’s hands-on business style and emphasis on owner accountability gained him a level of outstanding customer service that set him apart from the competition in the HVAC industry. His corporate motto was to do whatever was necessary to keep his customers happy. Ed felt it was fundamental to have knowledge and keep involved of all aspects of his business. As a testament to his business style, many of the relationships that Ed established in the earlier years still remain to this day. Ed’s son, Henry, joined the business full-time after graduating from the University of Pennsylvania. Henry gained valuable hands on HVAC industry experience by working his way through every area of the business. 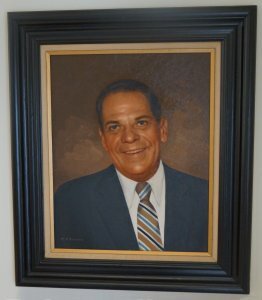 Upon Ed’s passing in 2002, Henry assumed the presidency of both companies. With 25 years of experience in all facets of the business, he is continuing his father’s legacy of a hands-on style of business management with a strong emphasis on customer satisfaction. Tom Hartman started at E.B. O’Reilly as a mechanic and after 22 years of hard work, his dedication and knowledge landed him the position of General Manager, where he was responsible for all operations of the Servicing company. Tom’s extensive field experience enabled him to provide technical support to our mechanics. Tom believed in the value of experience, training and certification to provide the highest possible level of customer service. He was extremely active in industry associations and was a member of numerous trade boards; he served as President of the Servicing Contractors Association of the Greater Delaware Valley (SCA). To honor Thomas R. Hartman’s commitment to the service industry, and remember his charisma, expertise and desire to always better ourselves and our industry, E.B. O’Reilly proudly established the Thomas R. Hartman Memorial Achievement award. This award will recognize an outstanding member of the mechanical servicing community who exemplifies the kind of leadership, perseverance and commitment to excellence that Tom demonstrated every day.